I have previously reviewed two of Darrell Pitt’s books from his Victorian era steam- punk series, The Firebird Mystery and The Monster Within. In both of these books I was swept along by the fast paced mysteries set in a magical world of airships, space steamers, a 200 mile high metro tower, lots of crazy machines and intriguing gadgets. 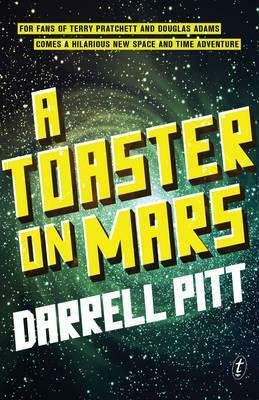 Now Pitt’s new book, A Toaster on Mars, is a stand-alone story set in the future- 2509. Once again, Pitt uses his excellent writing skills and vivid imagination to cleverly paint a futuristic back drop for this action-packed inter-galactic adventure. Neo City is a multi-layered metropolis built on what used to be the east coast of the USA. The buildings are up to1000 storeys high- linked by walkways and roads. It’s a world of flying cars, buses, taxi-gondolas and helium cyclists where cars drive themselves, people eat food-flavoured pills and travel between planets. A Toaster on Mars will spark many interesting discussions in homes and classrooms about the future. What will the world will be like in 2509? Bartholomew Badde is the villain of the story- a criminal mastermind. He steals the super computer- EMP and holds the world to ransom. So, Agent Blake Carter from the Planetary Bureau of Investigation (PBI) and his new partner, Nicki Steel are assigned to the case. Nicki Steel is my favourite character. She’s a cyborg- 90% robot and 10% human. She’s strong, brave, funny and is able to process information super quickly. When Badde kidnaps 12 year old Lisa, Blake’s ex-wife, Astrid joins the team. Together they go on a wild romp through the galaxy to rescue Lisa. I like the way Pitt injects the story with humour and clever intertextual references. I also like the way Pitt has included comments from the editor (Zeeb Blatsnart.) These comments start with Zeeb says: and are printed in italics. This is a unique way of explaining certain terms and concepts. I think this tool works well. There is one thing that concerns me. The main characters are all adults. Lisa is 12, but she is not a focus character. As a rule, kids like to identify with characters their own age. That said, I believe A Toaster on Mars will appeal to many kids aged 10+ years who would love to project themselves into Pitt’s entertaining vision of our world in 2509.